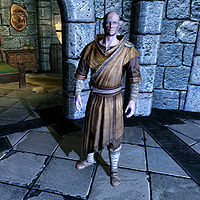 Sergius Turrianus is an Imperial instructor at the College of Winterhold and author of the book A Primer on Enchanting. Sergius is the expert trainer in Enchanting, able to train you up to level 75. Due to his skills, citizens from all over Skyrim use him to get their items enchanted, a task you can help him with during the Enchanting Pick-Up quest. This business also means he needs soul gems in huge quantities, and he will gladly accept your assistance during the quest Restocking Soul Gems. He sleeps in the Hall of Countenance, in the second room on the left on the second floor, every night between 3am and 11am and always starts the day with a one-hour lunch. At noon he heads over to the Hall of the Elements where he drifts around until midnight, interrupted only by a one-hour dinner at 6pm. Sergius is also the reason for the rivalry between College members Nirya and Faralda, as they are both marked as his secret lovers. At 11pm, Nirya will seek out Sergius in Hall of the Elements where they will spend an hour together. At midnight, Sergius heads back to his quarters where he wanders around until his bedtime at 3am. Between the quests Revealing the Unseen and The Eye of Magnus, when the Hall of the Elements is closed down due to Ancano's actions, Sergius will enter the Arcanaeum between noon and 3pm, then return to his quarters for the rest of the day (see bugs). He wears adept robes of Alteration and a pair of boots, but carries no weapons. Instead, he relies on a huge variety of spells, his expertise being the magical school of Destruction as he knows Fireball, Firebolt, Flame Cloak, Flames, Frostbite, Frost Cloak, Ice Spike, Lightning Bolt, Lightning Cloak, and Sparks. From the school of Alteration he can cast Ironflesh, while he will heal and protect himself with the Restoration spells Greater Ward, Healing, Lesser Ward, and Steadfast Ward. When you get near him he will reveal just how he thinks of the College's expertise in enchanting: "Enchanting services are one of the few things that keep us in touch with the rest of Skyrim. ", "I think we could blow up half of Eastmarch, and people would still come to us for enchantments." and "The local Nords may not like us very much, but they don't seem to mind having access to enchanted weapons and armor." 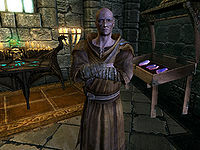 Before the quest Containment is initiated, he will also talk about Arch-Mage Savos Aren: "Savos doesn't care for politics. He likes to believe the College is removed from the rest of Skyrim." and will add: "If he could, Savos would float the the [sic] entire College above Skyrim, for all the Nords to see." Although he sounds helpful, he will not enchant anything for you and brush you off with: "I'm sure you can figure it out on your own. If you can't, perhaps Urag has a book you can read." If you repeat the question, he will say: "No. No I can't. I have enough to keep me busy. View it as a chance to hone your craft." If you choose to end the conversation with a 'thanks for nothing', he will add: "My pleasure." Although unhelpful when it comes to enchanting, he will be more than helpful when asked for training: "You've come to the right place. I'd be happy to teach you." He will not really participate much in the crisis concerning the Eye of Magnus, although he will be in the courtyard after the clash between Arch-Mage Savos Aren and Ancano, yelling: "The Arch-Mage is dead! Dead!" Until the crisis has been resolved, he will only say: "Gods, you'd better have something good up your sleeve. I've got nothing left." Like many other College members, he will be able to assist you during the daedric quest The Black Star. At the Shrine of Azuara, devoted worshipper Aranea Ienith will advise you to ask around Winterhold for an elf that studies stars. When confronted with this question, Sergius will be puzzled: "Studies stars? I remember the last time the word 'stars' was flown through the Hall of the Elements. Bad things had happened." Two options are available for an explanation, and both of them will point you towards exiled mage Nelacar. If you ask him what kind of things he is referring to, he will respond: "The kind of things that even the College won't tolerate. Things that can get a wizard exiled for life. There's an Altmer who's staying at the Frozen Hearth. Nelacar. You should speak with him, if you're so curious." You can also ask him if the College is hiding something and he will give you an answer: "Almost the opposite. The College got rid of something... someone, that was too much trouble. 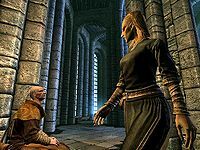 There's an Altmer named Nelacar staying at the inn outside the College. You should ask him about it." Sergius: "As always. The Nords don't ever stop wanting things enchanted." Urag: "At least it's more money for the College." Sergius: "Perhaps, but it just means more work for me." His claims about how the Nords need their weapons enchanted holds true when you ask him if there is anything you can help him with. 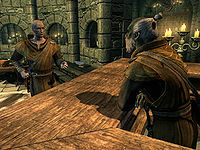 One of his tasks is a simple fetching quest, Enchanting Pick-Up, where you will fetch a weapon from a randomly determined citizen in Skyrim or Solstheim, pick up an item that needs enchanting, bring it to Sergius, and then deliver it back to the citizen once it's been enchanted. When asked about it, Sergius will say: "Sure is. I've got another client -- wants me to do some enchanting. You can do the pick-up for me, if you want." or "There's more enchanting to be done. You can acquire whatever it is and bring it back here, and I'll take care of it." If you decline, he will be mildly annoyed: "Perhaps some other time." If you accept, he will hand you the name and location of the citizen: "All right. Be quick about it, will you? This is a good way for the College to bring in some money. Here's the name and location of the client." When you return with the item, he will take it with the words: "Ah, yes. Thank you. I'll get to work on this right away." or "I'll add it to the list of things I need to take care of. Thank you." The second fetching quest he can offer you is Restocking Soul Gems. Basically, when asked if you can assist him with College business, he will ask for help: "I need some more supplies. Can you help out with that?" You can decline, telling him you have other things to do, which will make him respond: "Yes, well so do I. That's why I was hoping you could help." "I need some more supplies." I'm running low on Grand Soul Gems. I'm running low on Greater Soul Gems. I'm running low on Common Soul Gems. I'm running low on Lesser Soul Gems. I'm running low on Petty Soul Gems. "Ten more would keep me stocked for a bit." "Bring me another seven of them, if you can." "I need at least five more, if you can find them." "If you can bring me three more, that would be helpful." When you return with the requested amount and type of soul gems, he will take them from you with the words: "So you do. Thank you, this will help quite a bit." Player: "Is there any College business I can help with?" Sergius: "In fact, there is. I need a soul gem filled, if you're up to it." Player: "I can take care of that for you." Sergius: "Here, take this Grand Soul Gem, fill it for me, and bring it right back. I'll be waiting." Player: "You needed a soul gem filled?" Sergius: "Yes, a Grand one. Soon, please." Player: "Here's the soul gem you asked for." Sergius: "Excellent. Thank you, I'll see that this gets put to good use." Player: "Maybe some other time." Sergius: "Some other time? That's not going to help me much, now is it?" More missing dialogue can be found in the game files, under the topic 'I need something enchanted.' The rejection described above will always take precedence over two alternate responses: "Well, there's an Imbuer here in the Great Hall." and "Well, there's an Imbuer in the Great Hall." It is possible they were excluded because the wording is ambiguous; there is no "Great Hall", and an Arcane Enchanter can only be found in the Hall of Countenance, one of three halls at the college. Sergius was supposed to visit the Arcanaeum every day between noon and 3pm, regardless of your progress through the College quest line. However, his twelve-hour sandbox package for the Hall of the Elements takes precedence at all times, and, as a result, Sergius can only be met in the Arcanaeum when the package is disabled as a result of Ancano's actions, starting when you read Gavros Plinius' journal during Revealing the Unseen, and ending at the end of The Eye of Magnus. This page was last modified on 17 October 2018, at 22:17.